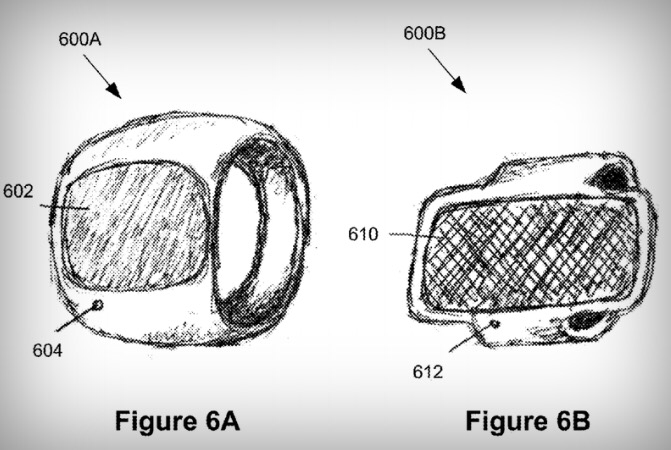 A smart watch without a touchscreen? Yes, that might actually be the thing. A couple of weeks ago I was pondering if the smart watch might be having a comeback, considering the releases of several new ones in spite of recent years of dropping sales. And proof of that just keeps getting stronger. Just recently a new smart watch, that differs from most others, saw the light of day. 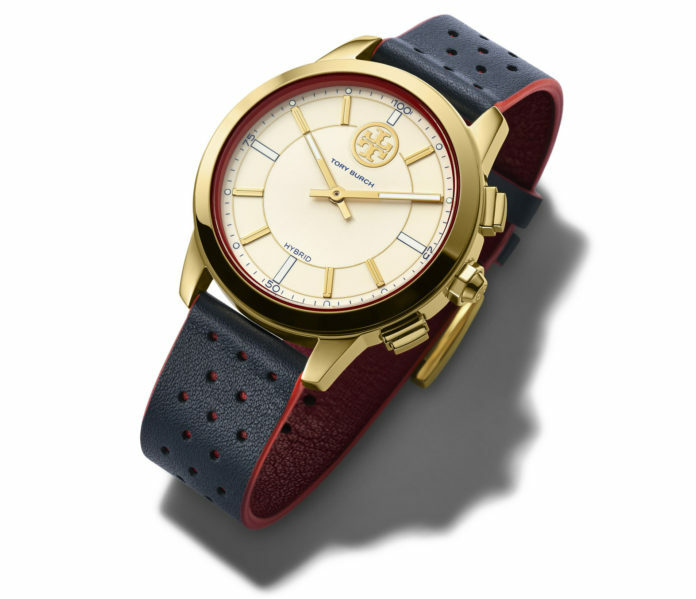 The new collection from New York Standard Watch hasn’t just kept the traditional wristwatch look with the round watch face and the leather straps, but has actually skipped the whole touch screen altogether. Yes, no touch screen! How does that even work, you ask. Well, they offer all the traditional notification and fitness tracking functions such as steps and calorie count, but display them on an analogue dashboard instead. It is actually kind of genius when you think about it. Me and many others have long argued that a piece of wearable tech simply must be aesthetically pleasing for us to even consider putting it on. But being easy on the eye might actually not be enough to succeed. It might also need that hands on, analogue, three dimensional feel to really make it. That perfect merge between tradition and innovation, the just right mix of old and new. I’m not saying NYSW has the final solution to this, but theirs is certainly an interesting step in that direction. Are smart watches having a comeback moment? Wearables in general and smart watches in particular were hotter than hot in 2015. Just shy of two years later though, the situation had changed. By the end of 2016, smart watch sales dropped dramatically. And so many other things had emerged in the fashion tech area that seemed so much more interesting; the development of retail tech for instance. 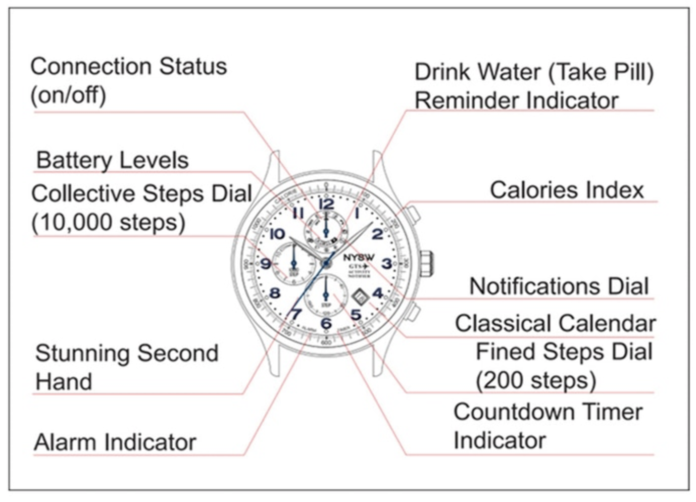 The age of the smart watch seemed to be over. Something that belonged to the infancy of this ever emerging innovation area. But you should never say never apparently. 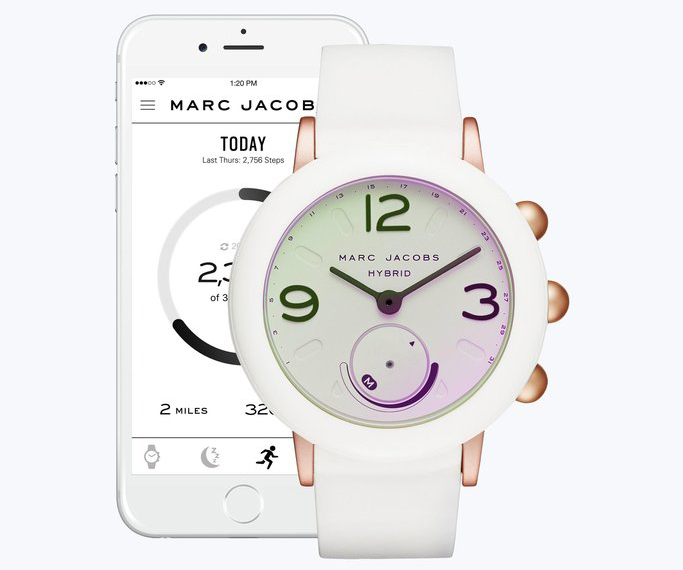 Only in the past few weeks, at least two new smart watch models have emerged: This week Marc Jacobs released his Riley Hybrid watch with basic functions such as step counting, and just days before saw the launch of Tory Burch’s Tory track Hybrid, with activity and sleep tracking. 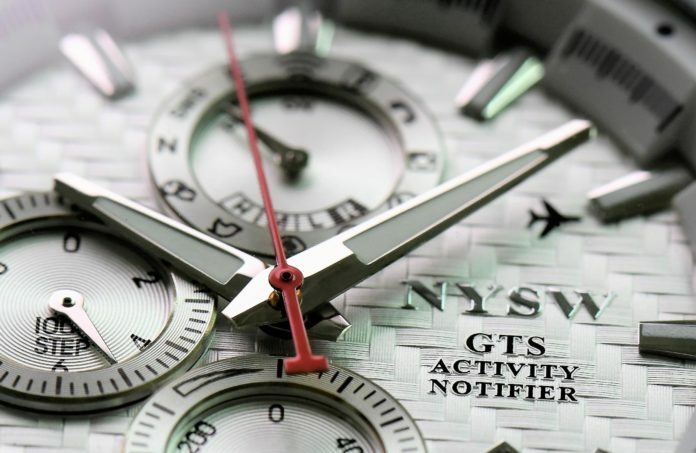 And on top of that, Swedish watch brand Triwa recently got financing to build contactless payment services into watch straps. What is going on??! Are we suddenly moving back in time? No, more likely is that the broader market is finally ready for this product. While the early adopters have moved on to other things, people in general may have started to notice these little gadgets and the way they differentiate themselves from the more commonly used, sporty looking, fitness trackers. Style may actually have won an important victory here. Ok, nu tror jag inte att jag sattes på denna jord för att bara skriva om smartklockor, men okej okej, en till då! För den här från Shammane var inte så tokig den heller. Det franska startupföretaget håller som bäst på att crowdfunda ihop pengar till denna lilla skönhet som ska konkurrera med Apple Watch och de andra giganterna. Shammane är främst tänkt att vara en diskret – och snygg – länk mellan bäraren och dess smartphone, med få funktioner och men desto mer ögongodis. Man har valt den stilrena vägen med minimalistisk urtavla och spännen i aluminium och utbytbara armband i kalvskinn och/eller jersey. Funktionerna då? Den är kompatibel med både android och Iphone och innehåller de basala notifieringsfunktionerna samt förstås möjligheten att sms:a och ringa samtal. Tror det kan bli något av detta jag. Antar att jag hejar på the underdog. Ok, I don’t think I was put on this earth solely to write about smart watches, but ok then, just this one! Because this one from Shammane is not bad at all. 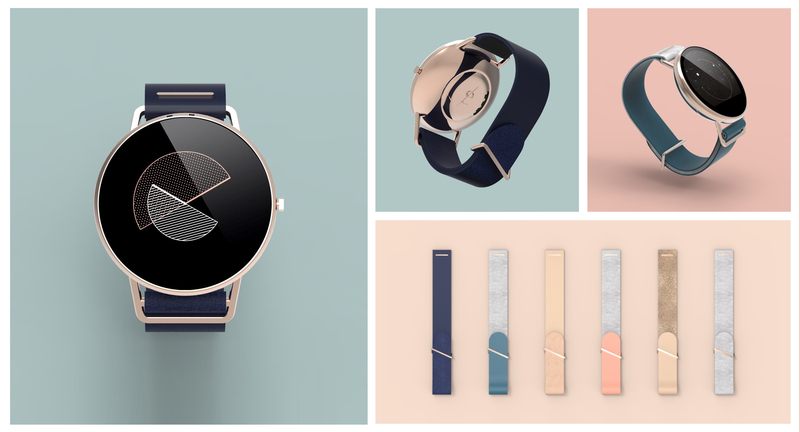 The french startup is currently seeking funding on Indiegogo for this little beauty that’s planning to compete with Apple Watch and the other giants. Shammane is supposed to be a discreet – but handsome – link between the wearer and its smartphone, with few functions and a lot more eye candy. They chose the classic look with a minimalistic watch face and locks in aluminum and bracelets in calf skin and/or jersey. I think they’re on to something. Guess I’m just rooting for the underdog. Måste ändå säga att Pebbles nya smartklocka Pebble Time Round ser mycket lovande ut. Det är nog den smäckraste jag har sett hittills faktiskt. Urtavlan är tunn och armbanden likaså. Batteritiden ska tydligen vara lite sämre än på den föregående modellen, men står det mellan en klumpig tjockklocka och en stilren snygging vet i alla fall jag vad jag väljer. Mesta dräggelfaktorn jus nu: Urtavlan i roséguld till vitt läderarmband. Pebbles nya smartklocka Pebble Time Round. I’ve got to say though, Pebble’s new smart watch is looking very promising indeed. This one is actually the slimmest one I’ve seen so far. The watch face is really thin and the bracelets as well. I’ve heard the battery time isn’t as good as on earlier models but if it’s between a bulky square thing and a slim classic look I know what I would choose. 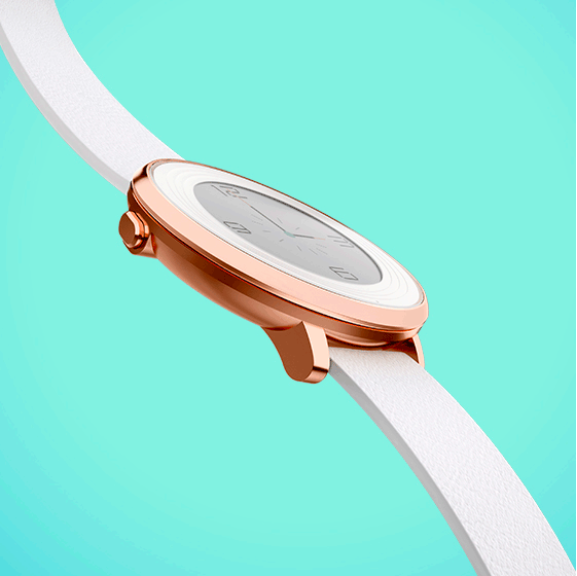 Highest drool factor at the moment: the rose gold watch face with the white leather band. Huawei har lanserat en ny smart klocka. I samband av lanseringen av den nya smartklockan lät man framtidsforskaren och mode- och teknologiprofesssorn Sabine Seymor berätta om sin bild av framtidens mode. Med den lanseringen är det uppenbart att Huawei har fattat vad det handlar om: klockans design måste vara klassisk, dyr och traditionell, men värdena som omgärdar klockan, dess image, måste ta sikte mot framtiden. Det är heller ingen slump att man har valt supermodellen Karlie Kloss att fronta kampanjen. Karlie Kloss har skapat sig lite av en tech-profil och lanserade i våras ett stipendium för tjejer som vill lära sig koda, något jag då skrev om här. Så hur ser då Sabine Seymors framtidsvision ut? Den handlade mycket om den intuitiva garderoben, där plaggen kan anpassa sig i längd och form och utseende efter bärarens önskemål. Hon ser också en framtid där vi går från uppkopplade ting, till uppkopplade människor och platser. Och där våra plagg, som precis som smartphones reagerar på beröring och gester, fungerar som mellanled. 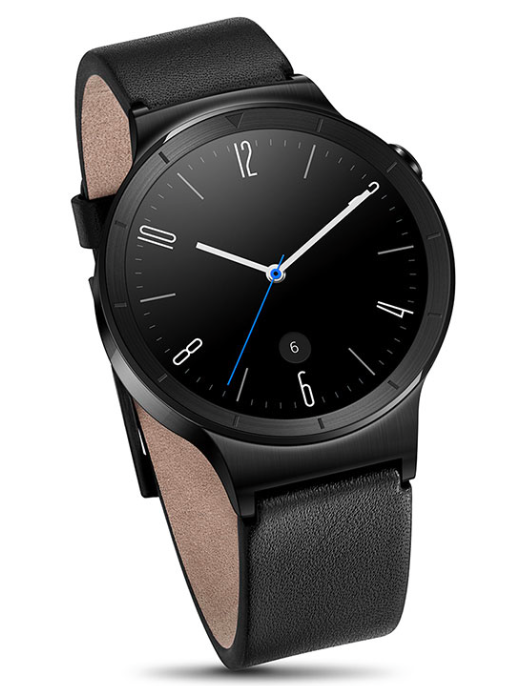 Huawei just launched a new smart watch. In connection with the launch they invited futurologist and Fashion- och Technology professor Sabine Seymor to share her vision of future fashion. With such a launch it’s obvious that Huawei has grasped what it’s all about: the design of the watch has to be classic, expensive and traditional, but the values that we associate with the watch need to look straight to the future. And it’s no coincidence that they chose super model Karlie Kloss to front the campaign. Kloss has made a name for herself not only as a model but as a bit of a tech buff and in the spring she launched a scholarship for girls who want to learn coding, as I then wrote about here. 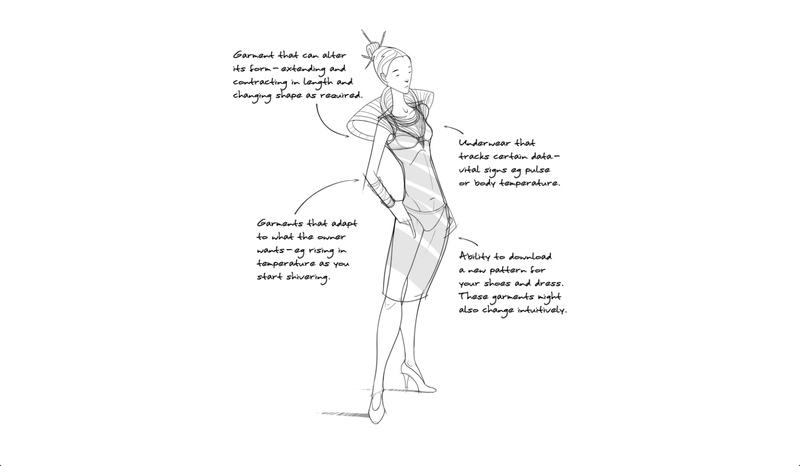 So, what about Sabine Seymor’s vision of future fashion? Well, it was a lot about the intuitive wardrobe where clothes can adapt in length, size and form according to the wearer’s wishes. She also sees a future where it’s less about connected devices, but connected people and spaces. And that’s where our clothes come in as the middle hand, as they will be connected, touch- and gesture sensitive. Apple fortsätter sin uppvaktning av modevärlden. Senaste nytt är att anrika modehuset Hermès har designat armbanden till nya Apple Watch, enligt kvällens Apple-event. Ja, hela tre armband och tre nya urtavlor närmare bestämt, och alltihop för lansering i oktober. Ett av armbanden blir en dubbelmodell som går två varv runt handleden; de övriga två blir mer klassiska. Men smakar det så kostar det. Enkelarmbandet går loss på 100 dollar och dubbelarmbandet för 1250 dollar. 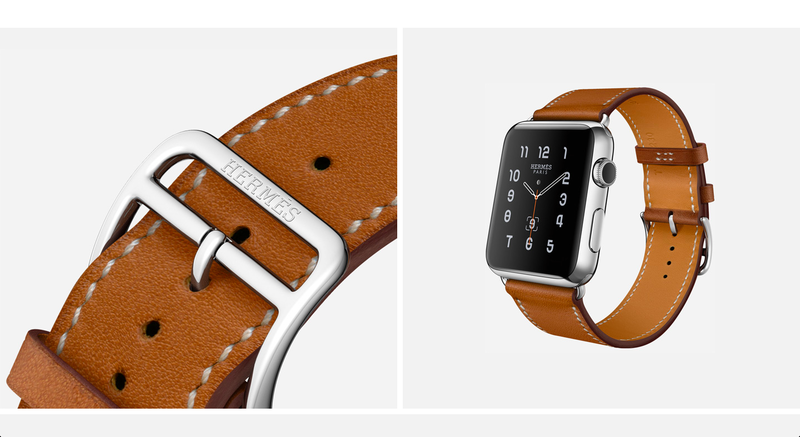 Screenshots av nya Apple Watch Hermès. 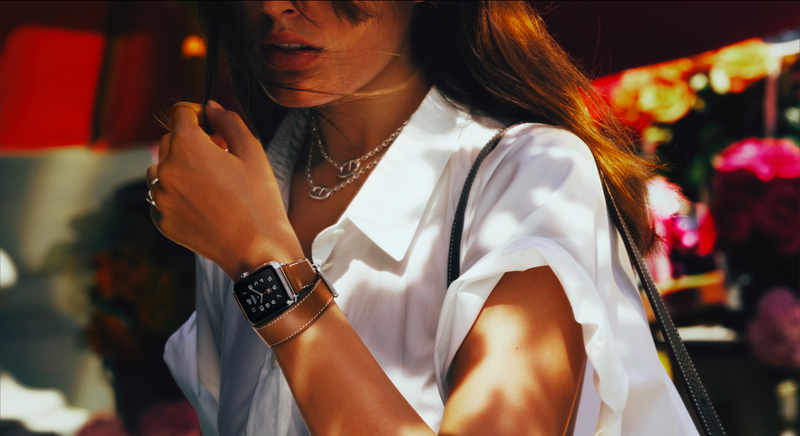 Apple continues to woo the fashion world. The latest news is that renowned Fashion house Hermès has designed the new bands for the new Apple Watch, as revealed at tonight’s Apple event. Well, three new bands and three watch faces to be precise, and all of them for launch in October. One of the bands will be a double model that wraps around the wrist twice; the other two more classical. But if you want them, it’s time to dig deep into your wallet. The ”Single tour” bracelet will cost you 1100 dollars, while the ”Double Tour” is an additional 150 bucks, 1250 dollars.